Unisport FC from Bafang in Cameroon’s West Province are currently number two in the Cameroonian MTN Elite One 2010-2011, which has to be classified as a major surprise. Unisport FC have the best defensive record in the league, having only conceded 5 goals in 11 matches. Nevertheless, the big talking point of the season has been Valentin Biloa, a rather unknown striker that so far has not gotten the attention he deserves for his performances. Biloa has actually scored six league goals in the last five matches, a scoring record that is quite rare for any striker playing in the MTN Elite One. Interestingly, his six league goals means that Biloa has scored 50 percent of the Unisport-goals this season. According to the official homepage of Unisport FC, Biloa is born 12.06.1988. His full name is Valentin Bertrand Biloa. Valentin Biloa was signed from Achille FC from Yaoundé before the season. Achille FC is a second level club, playing in the MTN Elite Two. They became number five in the 2009-2010 MTN Elite Two. It is difficult to find information about the performances of Biloa in the 2009-2010 season but he obviously scored a couple of goals and made some headlines. 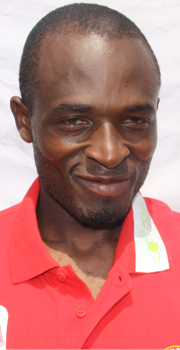 In July 2010, Biloa was included in the squad of the Cameroon U-23 national football team. The squad included several quality players, including Jean Patrick Abouna Ndzana (Astres de Douala) and Otélé Landry Mouangue (Canon de Yaoundé). In October 2010, Cameroon participated in a friendly tournament in Venezuela, consisting of Venezuela, Trinidad and Tobago, Nicaragua, Ecuador and Panana. Venezuela and some of the other teams participated with U-20 national football teams but Cameroon apparently sent a national U-23 squad to the tournament, including Valentin Biloa. Cameroon’s match against Venezuela U-20 ended 3-3 and it was Biloa that scored the equalizer in the 83rd minute, apparently a spectacular shot. At this point, Biloa had caught the eye of several top clubs in Cameroon and he decided to sign for ambitious Unisport FC. On 22.12.2010 Biloa scored his first goal for his new club against Union de Douala. His second goal was scored on 09.01.2011 against Lausanne de Yaoundé. On 23.01.2011 he scored two goals against Tiko United FC and yesterday he again hit the net twice – this time against Caïman de Douala. It is not an understatement to say that Valentin Biloa is currently on fire and obviously one of the most exciting strikers in the Cameroonian MTN Elite One 2010-2011. The picture is taken from www.unisport-fc.com.